I know that when I first started creating my graphic design studio, I remember having a to do list a mile long (about as long as a CVS Receipt) and I didn't know what to tackle next. Every resource I read or every webinar I watched talked about building your list, and building a course, and building your brand, and it all became very overwhelming. I've learned that there is no cookie cutter answer for everyone's business but I knew there had to be a way to process my to do list. When my graphic design studio was just a side hustle, it made me realize that I had to work smart, not hard in order to get things done with the little bit of time that I had. So I came up with a process over the years that helps me decide which task I should work on first. There is one disclaimer here that I have to say before going forward. I knew that I wanted my business to be in the long term game, so some of the tasks I chose were slower to come to fruition but they planted seeds for me as I grew. I knew for some things I had to start sooner than the others just because i knew that the ROI (Return on Investment) was going to take a little longer. Therefore, please don't think this is a get-rich-quick process. This is my process on how you can start taking action and in which steps so you can maximize your time and resources. We believe in creating a business that you enjoy and not choosing to do things just because it’s what you should be doing or what other people tell you to do. Decide what aligns with your business and values the best and then take action. Decide what your big goals, tasks, projects are in your business. Dream big, think of all things you truly want to achieve and write them down. Whether it’s big or small, write it down. After you have done that, you will choose specific goals and run them through the criteria we provide. For example, if I’m stuck between two projects and can’t decide which one to attack first, I will run it through the questions below. Another tip is to decide what you want to achieve out of your business do you can choose tasks that actually align with your business. If you want to grow your email list, then most of your projects and tasks that you write down should be with the intentions to grow your email list. Maybe you are looking for more clients, you will want to write down tasks that would attract clients. .01 | Which project is the low hanging fruit? Which means, which project is something that is easiest to achieve that I can start on right now. .02 | What will be the expense or cost of taking on this project? Is this going to cost money? If so, how much and do I have that money right now? .03 | How long will it take? If you’re trying to make the biggest impact in a short amount of time, then time becomes a factor in deciding which project. .04 | What resources and tools do I need to complete this project? .05 | Will you have to learn new skills to complete? Do you need to learn a new software? Or do you need to learn more about funnel marketing? Some skills can take a lot of time to acquire. .06 | Do you have the people on your team to make this happen? Is this a project that will require a team to help you? Do you have that team already in place? .07 | Will this make money while I work on other things? I love this question because we like to have completed projects making us money while we build the bigger projects. .08 | What is the maximum potential of this project? .09 | Is this something that brings joy? Like we’ve said before, we believe in creating a business that you really care about and if you’re passionate about something you’re more likely going to put the work and effort into it and enjoy it along the way. If you have no true passion for this project, then don’t do it. If you think it’s something that must be done and you don’t want to do it then you should consider hiring someone to help with that specific task. 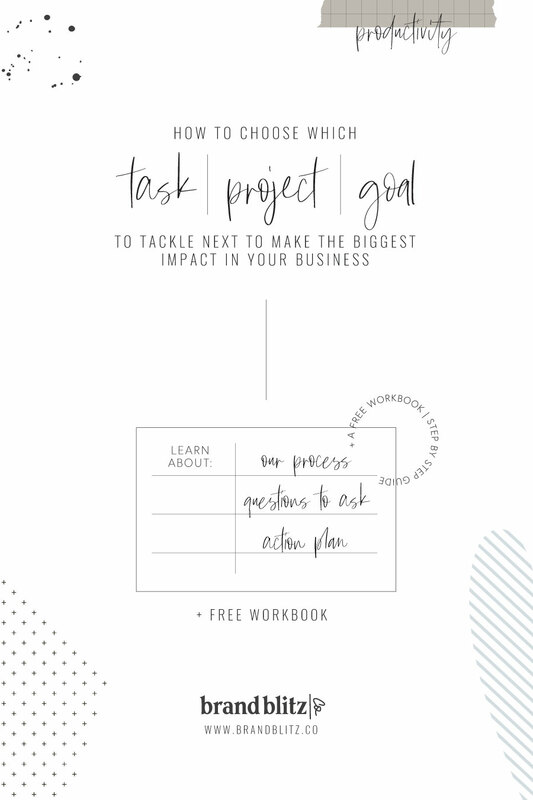 If you want these questions as a worksheet, we created a free workbook for you so you can fill out your tasks accordingly and see the steps visually. Now that you have ran through each project with this criteria, analyze which ones you can start attacking first. The simplest, quickest, easiest, and shortest time frame that’s actually worth your effort. For example, when I started working on my business, I knew I had my design services and I knew I wanted to create digital projects. When I had time away from client work, I would create my digital products. They don’t take as much time to create and once I have them setup then they can start making money as I work on design work. I also know that I want to create a branding course in the future, but I wanted to make sure I had all the tasks and resources for that, so I started with creating blogs posts with content upgrades so that I can grow my email list so I can create a community and be able inform them when it launches and make sure I’m creating something for my audience. Once you decide on which project to start on next, this is going to be the project that you will focus on until it’s done, list out all of the steps that you have to take to complete the project. Then decide how much time it will take you to complete the project and only focus on that project until you are done. This may sound easier said than done. This is probably the hardest part for me. I want to do ALL THE THINGS and I want to do them now. (Am I the only one who feels this way?) You will make a bigger impact on your task and business if you are able to focus on one project at a time. (Side note: the time used to work on this would be separate from client work, so I'm not saying to put client work to the side, but make sure you carve out time outside of client work to complete the project and factor that into completion time. I didn't see a big impact in my productivity and impact in my business until I started to get really focused on the task at hand. There have been so many times that I wanted to jump to the next thing, but it is best to realize how much more you'll actually get done if you don't jump from project to project. I realize it’s easier said than done, but that is why we believe in writing it all down so you can see it and stick to it. Our Free Notebook allows you to walk through all these steps easily and visually.